Vita Ruvolo-Wilkes was first published in 1977. She worked as a certified aerobics and exercise instructor. Upon graduating from the Wake Forest University School of Medicine, she worked for the VA Medical Center. As a physician assistant, Ruvolo-Wilkes designed specialized diets for her patients' conditions and has written a monthly health column in the "Montford Newsletter." Drinking orange juice with breakfast is a long-standing American tradition. It has just the right amount of sweetness, lots of vitamin C and helps wash down those morning meds. However, the latest studies report that orange juice, along with grapefruit and apple juice may actually inhibit the absorption of many medications. So, while the goodness of orange juice still nourishes your body, you may have to change the way in which you enjoy it. In the 1980s, David Bailey, Ph.D., a professor of medicine and pharmacology at the University of Western Ontario, found that fruit juice substantially boosted the effectiveness of getting the blood pressure medication, felodipine, into the bloodstream. However, since then, other researchers showed that the juice actually inhibited other medications. Bailey conducted more studies that fell more in line with other study results. According to Mercy Health Plans, Bailey presented his new findings in 2008. The outcome of a recent study showed that hesperidin, a chemical isolated in orange juice, reduced the absorption of the antihypertensive drug celiprolol in the intestines of rats. Other studies found that another chemical involved in malabsorption also exists in orange juice. It has the properties of naringin, a compound that gives a tart taste, also found in grapefruit. Specifically, these naringin-like compounds block absorption of the drug in the small intestine. As time goes on, more evidence appears that orange juice negatively affects the absorption of many medicines. These drugs include blood-pressure lowering meds, including the beta-blockers atenolol, celiprolol and talinolol. 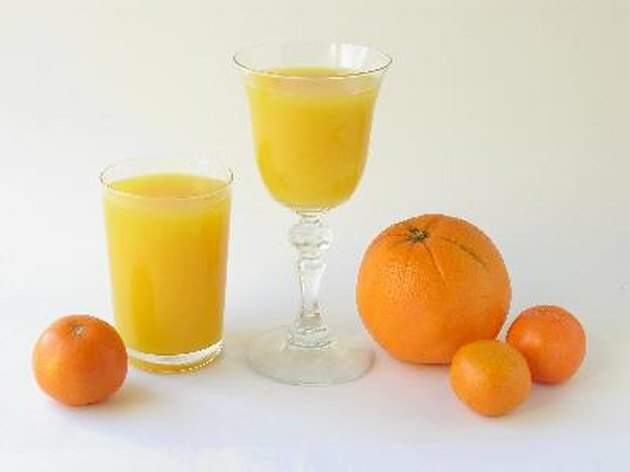 The effectiveness of the hay-fever treatment fexofenadine also is affected by drinking orange juice. Another study compared three groups of adults who took an antacid, Aludrox, by itself, with orange juice or with milk. The groups were compared for aluminum absorption. The researchers found there significantly higher rate of absorption in the group that took the antacid with orange juice than with milk or by itself. In this case, the results showed that orange juice boosted the amount of aluminum getting into the body, a deleterious effect. Unless you have another reason for avoiding orange juice, don't refrain from enjoying it without your medications. It provides vitamins, minerals and other nutrients. You should take your medications on an empty stomach with a glass of water. Drugs that upset the stomach will have a warning on their labels if you need to take them with food or milk. Generally, a cool glass of water helps to dissipate the drug in the stomach faster. Sips won't completely aid in the dissolution. Ask your doctor or pharmacist before combining multiple drugs. What Happens When You Eat Grapefruit With Xanax?